For a nation that likes to talk about the weather, the British have had much cause for conversation of late. Nine of the ten warmest years in meteorological history occurred this millennium and winter 2015 was the worst since records began in 1910. Global warming has never been more in evidence, suggests Colin Elkins, global industry director for process manufacturing at IFS. “In quick succession, British citizens have experienced the ‘Beast from the East’ and the hottest summer on record. Along with technology, climate change will have the biggest impact on what we farm, and the way we grow and manufacture our food,” he says. 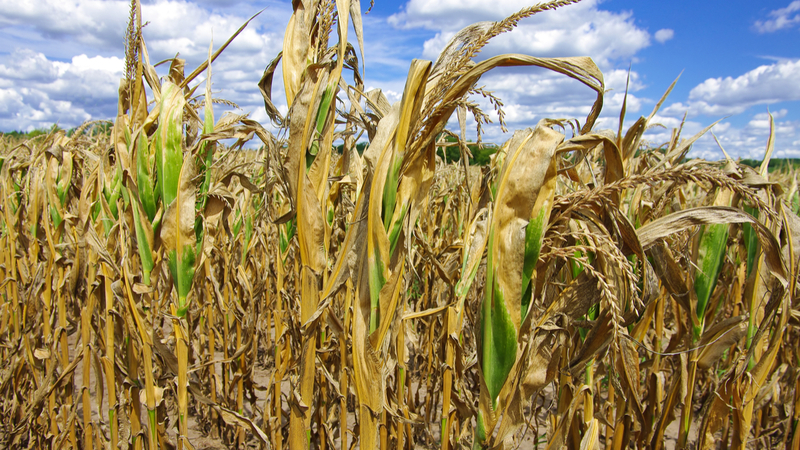 Heat stress has already been playing havoc with harvests worldwide, from maize in Africa to mung beans in Australia. Total UK domestic production, however, tells only part of the resilience story, according to Sarah Mukherjee, chief executive of the Crop Protection Association. “The UK is 76 per cent self-sufficient in homegrown food and 62 per cent in all food. However, much is exported and the UK currently supplies only 54 per cent of the food we eat. We are increasingly vulnerable to climate impacts, home and abroad,” she explains. In particular, grass shortages may limit domestic production and growth potential for livestock from traditional operations, as practised by pasture-based smallholdings. Of course, not all produce is adversely affected. The UK has also been pleasantly surprised by bumper crops of apples, pears, berries and plums, as well as more exotic edibles like olives and even figs. 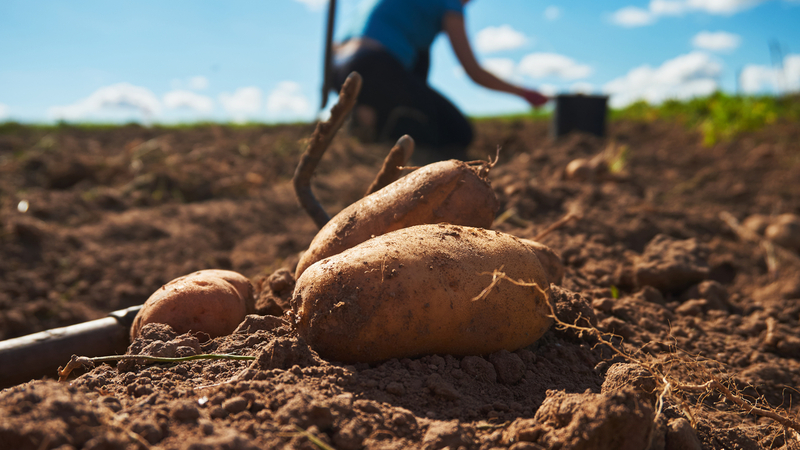 Innovations such as precision farming, artificial intelligence, metagenomics, gene editing, big data and cutting-edge crop protection will transform food production, improving yields whilst reducing environmental impact. A recent study found the UK is likely to be among the hardest hit from increased pest pressure on wheat crops due to rising temperatures, with yield losses expected to double from 5 to 11 per cent. The timing is particularly poor, and “comes when options for plant protection are being restricted, particularly in Europe, where farmers have lost over half the active substances approved for use since 2001”, adds Ms Mukherjee. Who would have thought ten years ago the UK would have the climate to create commercially viable tomato greenhouses in Kent? Nevertheless, sales of fresh organic produce and dairy continue to rise. Up six years in succession, the UK market is now worth £2.2 billion, albeit only accounts for 1.5 per cent of total food and drink. Furthermore, serious concerns about the impact of pesticides on pollinator numbers support ongoing usage restrictions. 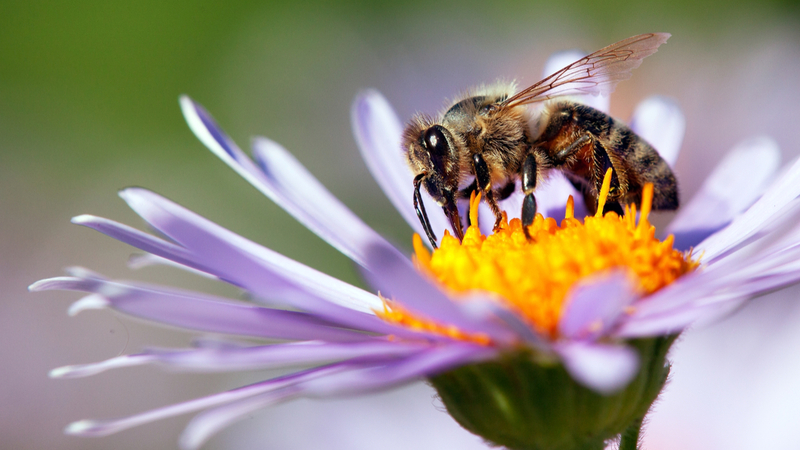 In the case of declining bee populations, scientific analysis and public alarm jointly prompted an EU ban on neonicotinoid insecticides. Hot or cold, wet or dry, the challenge to farm management is simply not getting any easier, concludes Professor Jonathan Jones of the Sainsbury Laboratory in Norwich. “Farming is about dealing with unpredictability, and as the world warms that unpredictability will become more severe,” he says. Faced with such flux, anticipation and adaptation can help bridge gaps between vulnerability and resilience. While extremes of weather cannot be avoided, farming best-practice can become better informed and decision-making improved. “Questions of when to fertilise, plant, spray or harvest have narrower windows for ideal action, and can no longer be based on common, farmer or institutional knowledge. Agtech, and particularly data analytics, will increasingly be the tools to mitigate risk and create a new institutional knowledge,” suggests Mr Kottmeyer. However, he claims that discussion is too often limited to thinking about production. The far greater impact of climate change will occur at harvest and down the supply chain, whether affecting quality of perishable food, or how to reroute rail, road or ship traffic based on volatile weather patterns. Technology is a clear and increasingly urgent focus area for industry investment. 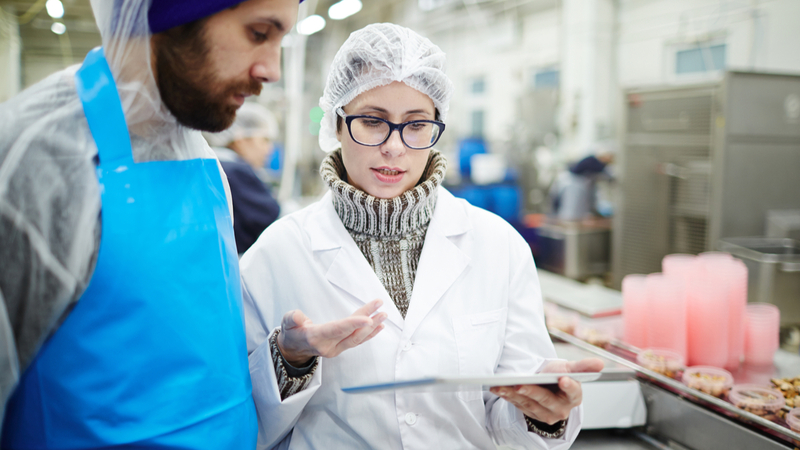 “The majority of IT and OT technologies within food manufacturers are disparate and outdated, or running on legacy infrastructure,” says Mr Elkins. 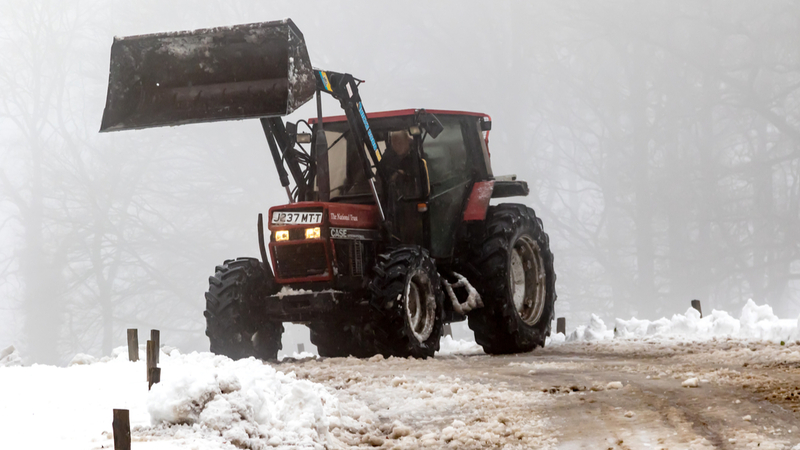 On the farm, applications tend to be separated, leaving maintenance and weighing systems unconnected. In addition, the majority of farmers have yet to harness internet of things solutions to see yields in real time. Furthermore, food manufacturers rarely have all-encompassing back-office software management systems to control data flow. Solutions do exist, however. With an effective enterprise resource planning or ERP system in place, for example, farmers can save valuable time through automation and standardisation, as well as achieve true visibility across operations. For the UK, faced not only with flooding, high winds and heatwaves, but Brexit, the field-based food production model of tomorrow will inevitably be about tech. However, its successful deployment will depend on joined-up, synergistic implementation and application. “The future for farmers is in the connected world. This means tying technologies together into coherent solutions. We’ve already started to see drones delivering feed to remote fields and animals, then feeding data back to farmers,” says Mr Elkins. Bee Vectoring Technologies is a Canadian startup which has developed a commercial alternative to spraying food crops with pesticide. This innovative new method uses bumblebees to distribute a naturally occurring, organic, inoculating fungus while carrying out their natural foraging cycle. The BVT system makes commercially reared bumblebees through a specialist tray dispenser as they leave their hive. They brush past a powder which clings to their fur. The powder is a naturally occurring fungus named clonostachys rosea which, when absorbed by a plant, enables it to effectively block destructive diseases, such as botrytis, in strawberries. The process has many merits. It reduces or negates the need for spraying pesticides, thus preventing chemicals entering the water supply. 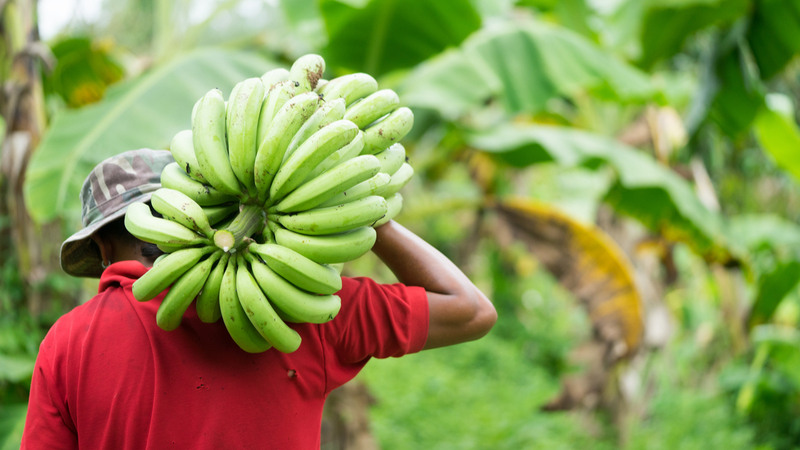 In a large-scale trial in Florida it delivered comparable or improved disease protection over sprayed chemicals, as well as increasing fruit yield by between 7 and 29 per cent. This fruit was independently shown to be sweeter and had a longer shelf life. In a recent trial on blueberries in Nova Scotia, yield increases were recorded at 77 per cent. And the bees, of course, are entirely unharmed. 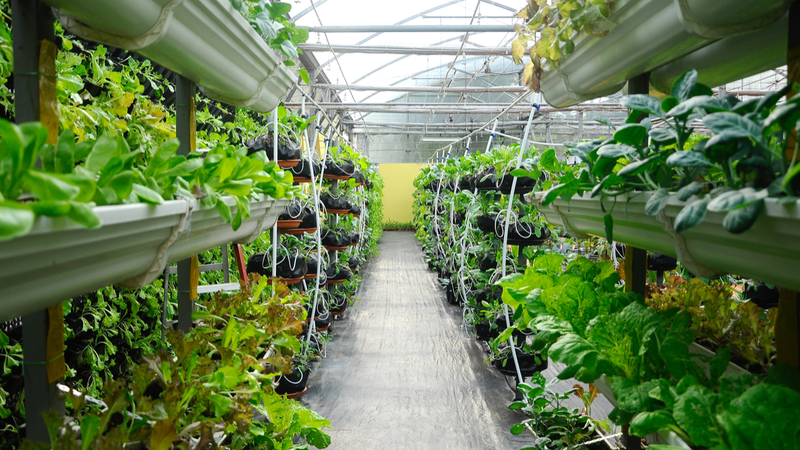 Vertical farming has been around for a while, but recently has begun to scale dramatically. A new scheme based in North Lincolnshire by Jones Food Company and Current, a division of General Electric, will be the largest indoor farm in Europe, producing up to 420 tonnes of leafy greens per year across a growing area of 5,120 m2 (equivalent to 26 tennis courts) arranged in racks rising to the height of 11m. GE’s role is to install more than 12km of its Arize LED horticultural bar lights, which offer a balanced light spectrum that catalyses growth and shortens the growth cycle. 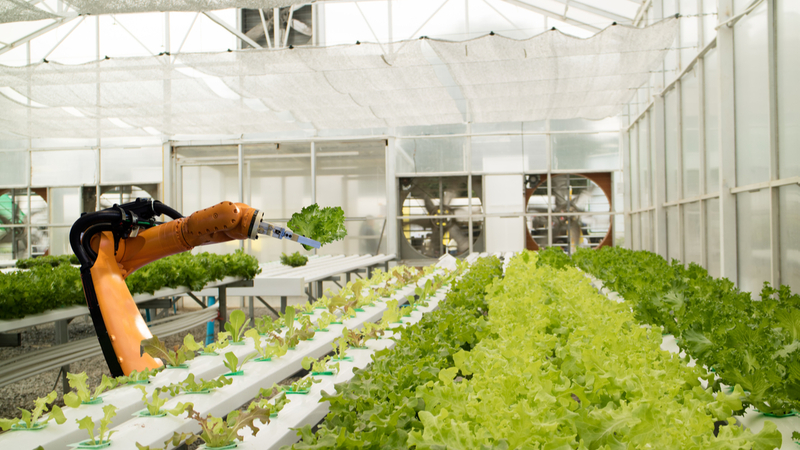 The facility is housed in a clean environment, so crops are grown in isolation from contamination. This makes it ideal for the beauty and pharmaceutical industries. It will use up to 90 per cent less water and 50 per cent less fertiliser than conventional growing methods, saving on input costs. Food production needs to increase by 70 per cent to feed the nine billion population projected for 2050. Phytoponics is a Cardiff-based company looking to revolutionise the efficiency of commercial greenhouses. Phytoponics grows vine crops, such as peppers and tomatoes, in an inflatable bag filled with water, which is attached to a pump to filter in nutrients and aerate the water. The grow bag is made of a flexible polymer which offers high performance, but is cheaper to transport and install than regular hydroponics systems. Founder Adam Dixon calls it a “jacuzzi in a bag”, and claims it uses 80 per cent less water than soil-based farming. Phytoform Labs uses gene-editing technologies to reduce carbon emissions in the agriculture industry. It does this by engineering specific plant traits and characteristics and then breeding them into the plants, so that their cultivation becomes more efficient and less energy intensive. For example, plants that have traditionally only been grown outdoors – and therefore emitted more carbon – may have their genes modified to allow them to be farmed more efficiently inside greenhouses. Both of these innovative companies are startups, and received funding from the Shell Livewire programme, normally focused on mainstream tech. We all know the robots are coming to automate farming. But the extent of the progress being made may surprise farmers. Projects such as the ‘Hands Free Hectare’ have shown that barley can be grown entirely without human interference. A PhD student at King’s College London has developed the Growbot, which lets farm workers with no technology skills program it to perform manual tasks. The project has ongoing funding from the Agriculture & Horticulture Development Board. In the dairy industry, Universal Robots makes a robot arm able to automate labour-intensive tasks such as manually disinfecting cows’ udders before and after being milked. Perhaps the trickiest area is fruit picking. Rosberg Green House is utilising a universal robot gripper to pick herbs and flowers. The two “fingers” of the robot gripper have built-in intelligence and advanced technology that mimics the way humans instinctively use our sense of touch when we grab things to move them. This means that the delicate produce is not harmed during this process. Also worth mentioning are robots made by Autostix and ISO Group, which are able to take cuttings. 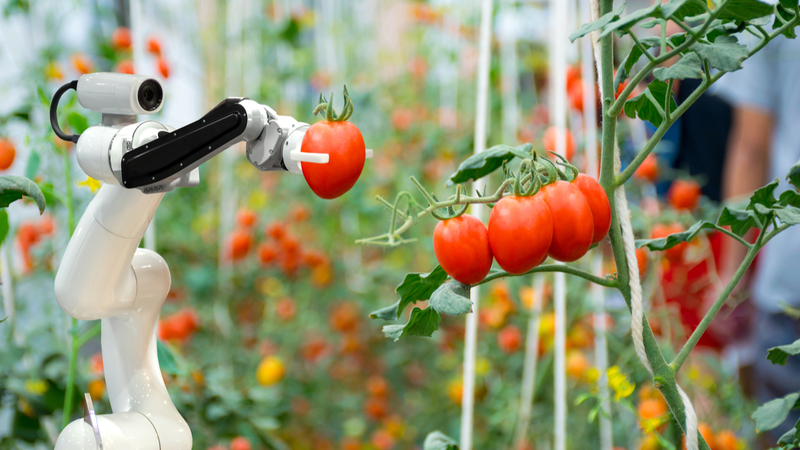 At the current rate of progress, automated farms could be mainstream within the next five years. Of course, blockchain also gets a mention. 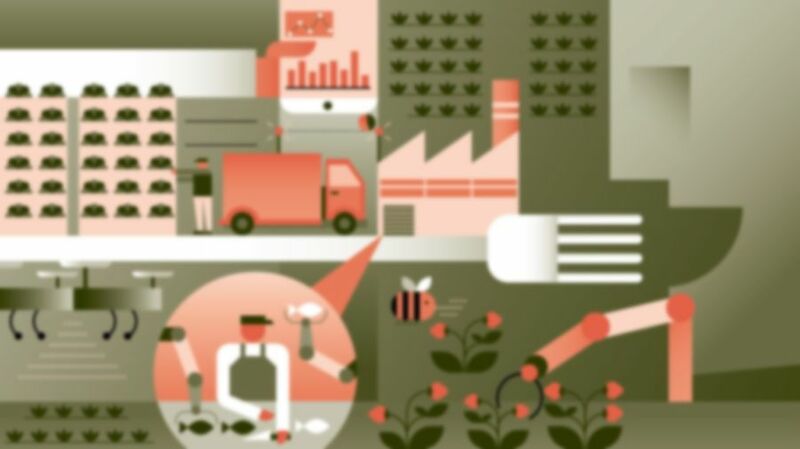 The most hyped technology of our era is seen as a potential game-changer in creating trusted and transparent supply chains, and farming could be its ideal market. Thai Union, the world’s largest seafood producer, is partnering with blockchain specialist Eachmile to monitor production from the fishing vessel to shop floor. There’s a clever twist to the project: Etherium-based cryptocurrency Fishcoin is used to incentivise accurate reporting. Workers can be rewarded for correct practices with Fishcoin, and made accountable for issues. It’s early days for blockchain in the supply chain, but with the Chinese government alone investing more than $3 billion since 2016, there’s no doubting its potential to the future of farming across the globe. The food industry is undergoing huge transformation, with the emergence of new super markets, new ingredients, and new proteins; retailers coming up with new ideas, from smart packaging to clean labelling; and new legislation to comply with. This creates massive challenges for food manufacturers. However, their ability to innovate and adapt in order to meet those challenges makes the factory the real trailblazer in the world of food production. Spare a thought for the factory planner, tasked with ensuring that output meets demand, while factoring in weather patterns that can affect yield, transport issues that can affect deliveries, and even which cookery programme people watched on TV the previous night that could influence what they will want to eat the next day. For example, I recall one company that manufactured sandwiches and whose main outlets were motorway service stations manually adjusted sales forecasts by up to 40 per cent based on whether certain football teams were playing at home or away, to account for the movement of their supporters. All of this information has to be gathered and fed into the factory systems, and this is what factories have been doing for decades, admittedly using older technology and mainly data from internal sources, like sales and forecasts. But factories have always been smart, and they are getting smarter. New technologies, such as artificial intelligence (AI) and the internet of things (IoT) enable large volumes of external data to come into the factory environment via the cloud and integrate with the internal data for analysis. This provides the clearest insights into what might happen to a production plan, and allows the factory planner to make better decisions in real time. The external data can be drawn from a variety of sources. 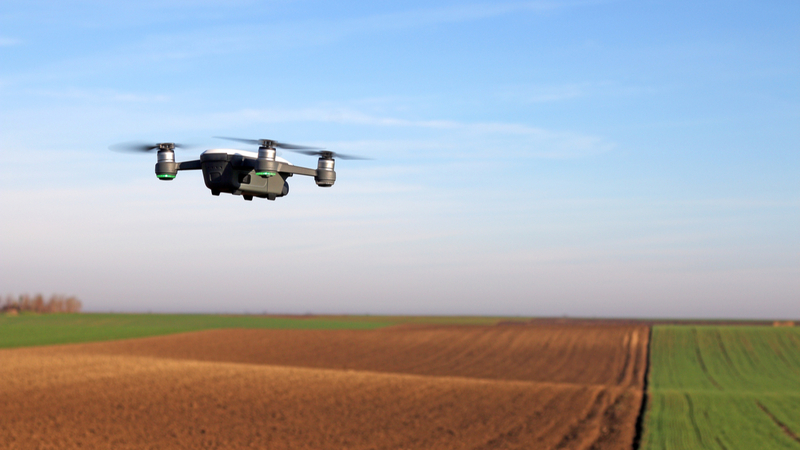 Drones, for example, are being deployed to monitor crops and estimate yields, generating remote data that can be sent by growers and suppliers to buyers. Ultimately it can be fed directly into factory model. Nowadays, most delivery trucks have some sort of GPS system that makes them visible and able to be tracked. With this data planners can accurately predict a truck’s arrival time at the factory and staff production accordingly. Likewise if the truck is likely to be delayed by heavy traffic, other delivery slots can be rearranged and staff can be organised to be available when they are needed. Bringing this remote data into the factory environment creates efficiencies, saves costs and improves yields. Another pillar of the food business is automation, a new technology for many industries, but adopted by food factories years ago to monitor, measure, adapt and improve products. Take rice, for example. In the factory every single grain of rice is measured for colour, length and breakages to differentiate between premium and lower grades of rice. I saw this process 20 years ago, using much less sophisticated technology of course. 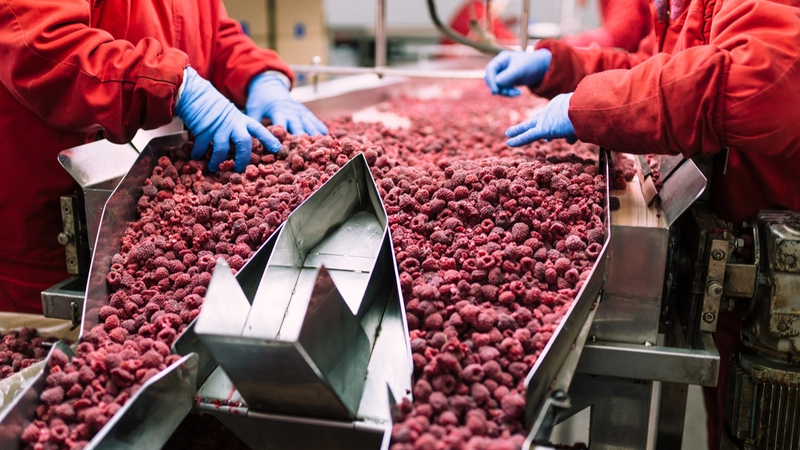 Food factories today are using the latest AI-based laser systems to check every individual item of product for size and colour, and reject any that don’t meet the exact specification, driving up quality, speed and cost efficiencies. Automation technology is evolving to become smarter and more versatile, with greater use of AI to self adjust to maximise yields, and to drive efficiencies in other areas such as production-line cleaning. When a factory switches from making organic to non-organic products, or allergens to non-allergens in products, the washing of the line is critical, but can take four hours to complete – a huge amount of production time. AI-controlled self-cleaning lines are the solution. That said automation in food factories does have its limitations, especially where processes rely heavily on dexterity. For example, it is still more cost effective to fillet fish by hand. Machines can be programmed to do it, but they lose around six per cent of the fillet. With their 3D vision and more accurate sense of touch, humans can get higher yields with certain products. For this reason I don’t see robots ever completely replacing people in factories. Yet the same technology is providing solutions to that other industry challenge: labour shortages. The trend we are seeing is for more ‘co-bots’ – people working alongside robots, in the factory space. This technology is smart, flexible and able to take on much of the mundane work done by an operator where it is possible to do. Automation, AI, IoT and the fact that factory assets are no longer autonomous but connected to networks and other database handling environments, is the key to unlocking data that determines so many factory decisions and operations. For the quality management team, this data is crucial. Retailers can and frequently do conduct on spec audits of the factories supplying them with products. Failure to provide the right data in a timely manner can lead to huge fines or contracts being terminated. I’ve seen companies that have spent a fortune on their line lose it overnight because of a failed audit. The key to avoiding that is to have everything connected – quality systems and information, factory systems and information – and be able to produce required data very quickly. With that combination of data, people, automation, AI and IoT, we have the technology infrastructure – the digital string – that pulls it all together. Today we have factories that are effectively self monitoring and factory planners making better production decisions on labour usage, product specifications, and speed of line, in a more sophisticated way than people could ever appreciate, all in real time. The modern food factory is the unsung hero of the food industry, at the very heart of that unique field-to-fork food journey. When people talk about the future of food, in the factory the future is already here.